An appendectomy is the removal of the appendix. The appendix is a pouch that is attached to the large intestine. An appendectomy is often done as an emergency procedure to treat appendicitis . Appendicitis is inflammation of the appendix. It can be caused by an infection or obstruction. Antibiotics will be started right away. Appendicitis is an emergency condition. Surgery is almost always done right away. A short incision will be made in the right lower abdomen. The appendix can be viewed through this incision. The appendix will be detached from surrounding tissue. Any bleeding from the blood vessels will be stopped. The appendix will then be tied off and cut out. The incisions will then be closed with stitches or staples. If the appendix has ruptured, a warm water solution mixed with antibiotics will be used to wash out the inside of the abdomen. A catheter will then be placed to drain any fluid that builds up. Sometimes, with a rupture, the surgeon will only close the muscle layers and leave the skin open. The open skin wound will then be packed with a moist gauze dressing. Anesthesia prevents pain during surgery. Pain and discomfort after the procedure can be managed with medications. You may be in the hospital for up to 3 days. If you have any problems, you may need to stay longer. 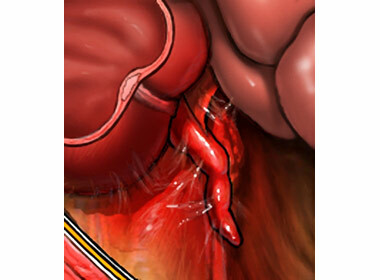 If your appendix ruptured, drainage tubes will be removed after a few days. Rest and take it easy for 1-2 weeks. Slowly increase activities as approved by your doctor. Appendectomy. Johns Hopkins Medicine website. Available at: https://www.hopkinsmedicine.org/healthlibrary/test%5Fprocedures/gastroenterology/appendectomy%5F92,P07686. Accessed January 10, 2018. Appendectomy. Kids Health—Nemours Foundation website. Available at: http://kidshealth.org/en/parents/appendectomy.html. Updated March 2013. Accessed January 10, 2018. Appendicitis in adolescents and adults. EBSCO DynaMed Plus website. Available at: http://www.dynamed.com/topics/dmp~AN~T115548/Appendicitis-in-adolescents-and-adults . Updated October 25, 2017. Accessed January 10, 2018.